OK, so it’s not exactly magic, but that 2-feet-long area highlighted by the green bar is the product of those three boxes of cardboard waste. Pretty amazing, huh? We think so. 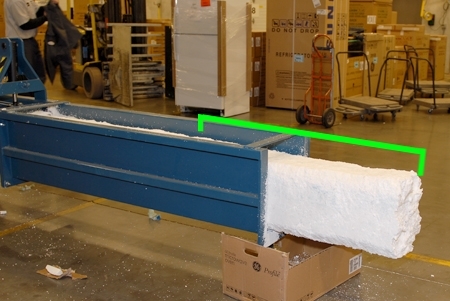 That’s our new densifier, which grinds up the bulk Styrofoam from appliance packaging and converts it into a form that can be reused as another product, while reducing it by a 20:1 ratio. 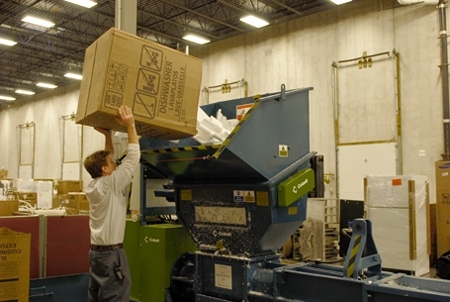 Waste Management used to haul off our 40-yard waste roll-off container about every four days. Now, we’re down to about once per month! The process is EXTREMELY labor intensive. 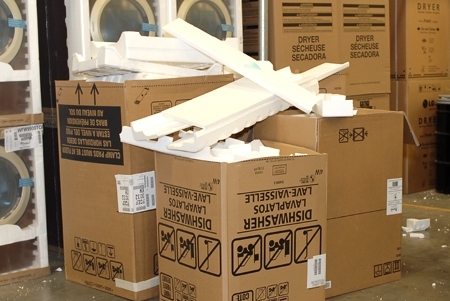 The Styrofoam must be completely clean for the densifier to work properly. This means no tape, no staples and no cardboard pieces. Zach loads the clean Styrofoam into the densifier. We're taking video of this very soon. 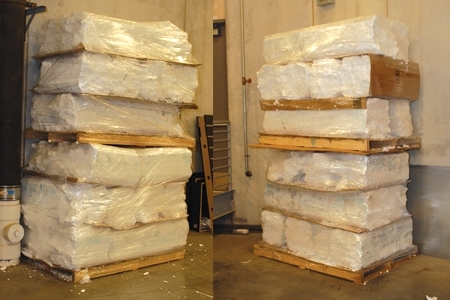 This is all the Styrofoam we've "densified" since we got the machine in mid-November. Multiply this air space by 20 and that's what the pre-densified material would take up! We’re proud of the fact that we’re WAY ahead of the curve for an independent retailer of our size. Last month, a vice president of Frigidaire/Electrolux toured our warehouse here in St. Paul and commented that only two or three facilities on par with ours exist in the independent network nationwide. Previous Why do front-load washers take so long?